I will post a picture a month. Hey AndreaC. I have 40 and 63 from Aldebardan, planted today in plastic food type containers in similar compost and put into cold greenhouse. Will be interesting to compare growth? Are yours in heated area? Hi Keith, I'm glad you've seeded them. 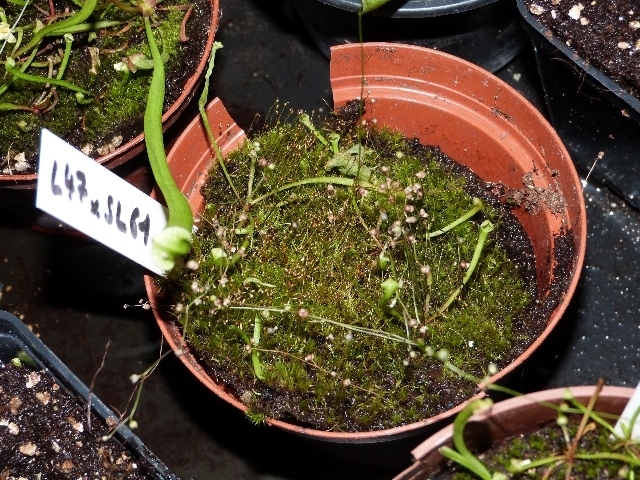 My seeds are placed in plastic jars, substrate formed by peat, perlite and a pinch of vermiculite. Below 5 neon ( 2x 865, 2x 840, 1x 827 ) switched on for 16 hours a day. Terrarium temperature: day 25 ° centigrade, night 20/21 ° centigrade. have some going too so thanks for posting, as Keith says be good to compare and see some others experiences. Have you had them in the fridge before? Do you plan to go for feeding and skipping their first winter? I have gone old school too Keith and they are cold and wet outside, will be a while before we see them, I think maybe we will see Andreas seedlings first and I must just think that it is good that they will take some time as I do need to find a permanent home for them to live in! I will start a new post for some close up pics....This is a HCW clone with just visible (top of seed) roots appearing. Taken with one of those cheapy USB microscopes. I put the seeds in the fridge for 2 months in test tubes. I will not feed him. I will skipping the first winter. I am also interested in your comment. I sowed seeds last winter indoor under LED lamp and also this winter. 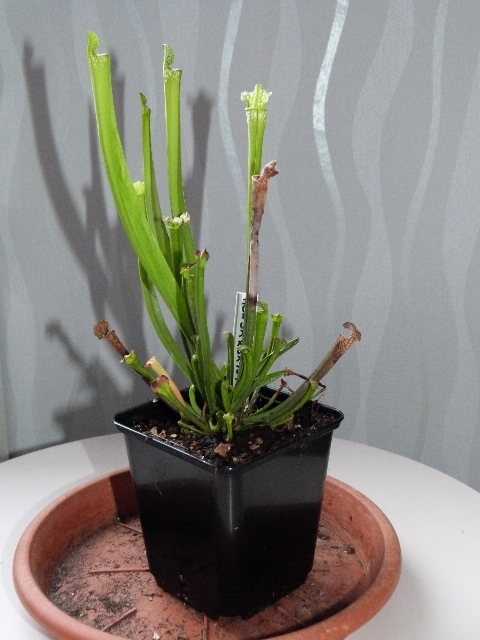 I am impressed by the growth of the crossing Leucophylla Hurricane Creek White Clone 5A X Wilkerson's red OP SX101. I shall post photos this evening. Some are not too badly. Hi, I think your plants on the last two pics are suffering because of too low light. How do you illuminate them? 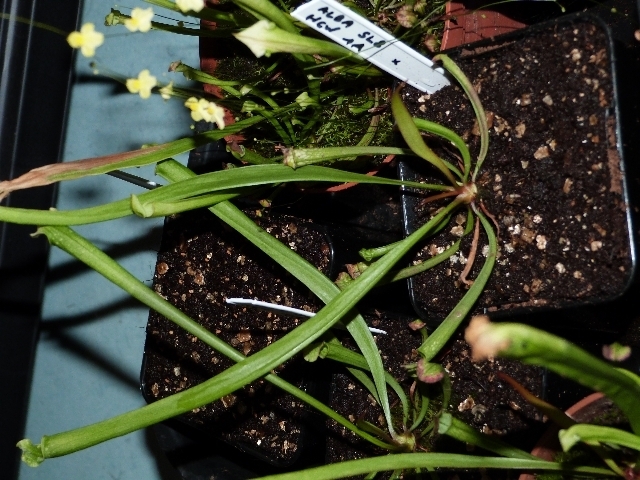 I see the hybrids grow much faster than the crossings between S.leucophylla. My seeds are sprouting these days! I cannot draw this conclusion because on the same sowing, there are big differences of growth. Ok. We are waiting for them to grow up. 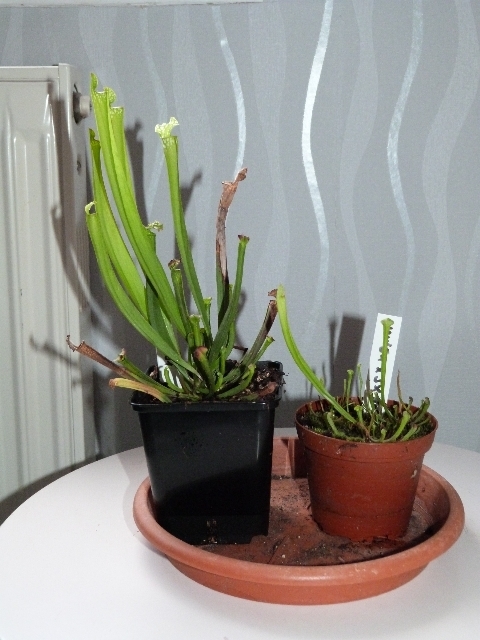 Sarracenia number 43 and 47 grow well; the others a little less.